We are pleased to recognize Western Stevedoring’s recent donation of $400 to support marine education and outreach at the Cowichan Estuary Nature Centre! This corporate donation will go toward a new freshwater aquarium at the Centre which will be home to our Coho fry as a part of our “Salmon in the Classroom Program” in 2018. 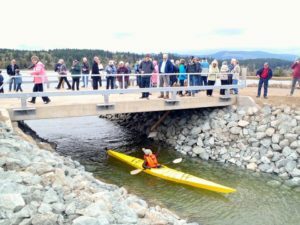 Nature Centre Volunteer Connie Harris takes her kayak through the newly breached causeway to help salmon move in the estuary. Terminal Manager Rob James and his team at Western Stevedoring in Cowichan Bay are experienced hands-on contributors to environmental education and restoration in the Cowichan Estuary. They’ve worked in partnership with the Cowichan Estuary Restoration and Conservation Association, Cowichan Tribes, the Department of Fisheries and Oceans, and other local industries like Pacific Industrial Marine, to breach the causeway in the estuary and help young salmon more easily find their way to protection and nourishment in the estuary’s eelgrass meadows on their journey to the sea. 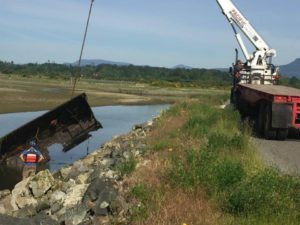 This past June Western Stevedoring also joined Brian Thacker and his crew at Pacific Industrial Marine, plus a team from Western Forest Products, to remove derelict boats from the estuary that posed a risk to the environment. These three local companies shared the cost —estimated at between $40,000 and $50,000 — of removing six derelict boats from the Bay. A helicopter lifted two wrecks from the water, where it was too shallow to tow the vessels without damaging the estuary, and four boats were towed to the Western Stevedoring terminal dock and lifted out the water with a crane in preparation for dismantling.